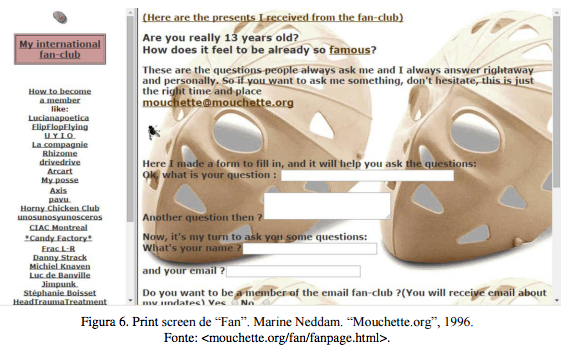 From the artistic proposal “Mouchette.org” (1996) authored by Martine Neddam, this dissertation deals with net.art features focused on the sharing and interactivity. It is our interest better understand the transformations that occurred in personal representations related to artistic production after the spread of internet access. What are and how they occur the processes that enable the survival of a proposal of art based in the mediation of digital interfaces and devices programmed, as is the case of “Mouchette.org”? What are the broad consequences of mutual crossing between the human and technical devices? How can we to think this work of art, that effective itself in staging of virtual personas? These questions composes part of a plot in which cross each the ideas of tecnoimage, programmed devices, “thinking machines”, interactivity, incorporation, human as cyborg, nature-culture, staging of multifaceted subject and poetic production on the internet. Each of these points has its network of authors, of which we highlight the comprehension of Vilém Flusser about tecnoimages, the overcoming of the dichotomies of nature/culture and organic/synthetic, by Bruno Latour, and the conception of Lucia Santaella about the human as Being the technique, condensed in idea of cyborg. Of this weft, we extract the flusserian sense of Homo Ludens, as the subject that is the holder of “techno-imagination”. The “techno-imaginer” would be the player, able to deliberate on the data available to elicit improbable information. The player’s act of deliberating, in “Mouchette.org”, happens in conjunction with the mutual incorporation between device, programming, virtual persona, multifaceted subject and information. The union of the concepts of deliberating and incorporate provides the spyglass through which we see the appropriation strategies of art forms based on the internet. In broad terms, with studying of “Mouchette.org”, we aim to build critical content about the demonstration and the dismantling of a world perceived and erected through devices and increasingly complex programs. Keywords: Mouchette.org. Net.art. Deliberation. Incorporation. Appropriation. Its synthetic flesh gains substance through the collaboration of spectators-agents, which gives it a mutant survival. While it is not possible to list Mouchette’s virtual persona strategies to incorporate all the fuzzy subjects who touch his pixelated skin, in each of the past chapters we inevitably describe some of these mechanisms. Thus, from the first chapter we indicate the “hidden destiny” as one of these mechanisms. We see how the user does not have the knowledge of the consequences of his deliberation and that this exercise is not negative, as it is not necessarily negative any exercise with the synthetic images and the devices programmed. By taking shortcuts that may lead to information streams, or in dark, empty rooms, or even asking questions for a direct dialogue, the viewer-agent accepts the rules of the “Mouchette.org” game and incorporates little To little, to the body of the virtual person. In the second chapter, the narrative method of cut-up can also be understood as part of the rhythm that assimilates the interlocutor, because it involves it in a way that forces the observation of the norms of reading internal to the work. This assimilation, however, depends to a great degree on the availability or receptivity of the viewer-agent to follow the choppy flow of the information presented to him. Put the reader, viewer or user inside this laboratory and part of this appropriation. Directly connected to this receptivity, appear the dialogues with the synthetic meat of Mouchette. By sending personal emails to viewers-agents while they are not exploring work pages or even unaware of their connectivity, the virtual persona is set to be incorporated by demonstrating “their” wishes. This sort of manifestation, instead of an internet-based art work, drags the meaning of “thinking machines” and reminds us of the urgency of a symmetrical treatment between human and non-human voices in understanding our more recent relationships with Technological apparatus. Through the pieces “Lullaby for a dead fly” and “To Be Or Not To Be Mouchette”, we could observe how Mouchette regroups the fragments, the detritus, left by his spectators-agents, without they being completely erased from the result. The game of questions like “How can I write this since I’m dead?” And “What’s the best way to kill yourself when you’re under 13?” Keeps the interlocutor involved in an unsolvable conflict: Mouchette “dies, the virtual persona Mouchette gains flesh and life time. D) Uses all of these processes of interaction to form a concrete technical object called virtual person. The extensive scenario, within which these four characteristics are possible to be realized, is composed of several blocks of soluble borders. In a block we painted the internet as a laboratory of programmed handsets. This conception assumes concepts of Bruno Latour and Vilém Flusser to create familiarity with the ideas of “thinking machines” in close dialogue with the human being without abiding by “dry cuts” between nature and culture, organic and synthetic, subject and object or politics and science . Another block draws particularities from the first to assert a human being as a nebulous cyborg species. This subject is presented metaphorically as a cloud among other clouds by bringing the qualities of dissolving to be incorporated and condensed to incorporate other subjects, human or non-human. From this nebulous cyborg conception, we walk the path to a block of ideas in which language appears as the first technical apparatus incorporated by the human being. This idea assumes the viewpoint of Lúcia Santaella, with respect to cultural formations that follow each other without canceling out. The oral, written, printed, media and cyber cultures culminate in the phenomenon of convergence, described by Giuseppina Pellegrino. The layers of cultural formation in convergence mirror a broader block of ideas, which could even contain the others. With the proposal of Vilém Flusser’s culture history we add abstractions to our relationship with the world, which leads us to process it in specific ways: three-dimensionality, two-dimensionality, unidimensionality and zerodimensionality. We would depart from the abstraction of circumstance by the observation of phenomena, abstracting the circumstances in images, the images in texts and the concepts in codes translatable in circumstances. In the final stage of this proposal of the history of culture we find the synthetic images and their transcoding power. Unlike traditional images, synthetic ones are only producible and assimilable through experience with complex systems in programmed apparatus that exceed the human scale. With this thread, we return to net.art as the heir of a “family of technical images”. A final and important block of ideas assumes Flusser’s Homo Ludens as the subject holding “techno-imagination” and this quality as the power of free acting in a world codified by the programmed apparatus. The “techno-imager” would be the player, able to deliberate on the available data to bring up unlikely, new information. We indicate, then, that the act of deliberation of the Flusserian player takes place in conjunction with the mutual incorporation between apparatus, programming, spectator-agent and information. The union of the concepts of deliberation and appropriation provides the lens through which we see the strategies of appropriation proper to the forms of art based on the Internet. Finally, it is fair to consider the openings of this research. Each of the blocks and even some specific concepts and authors could be worked on several fronts. Internet-based art forms are among the movements and aesthetic experiences with the greatest scarcity of theoretical treatments among the latest art achievements. Its preservation and exhibition are even more intense and urgent injections of attention, given the unavoidable acceleration of technological transformations. In this sense, these pages can also be understood as a food for “Mouchette.org”. If the mutual incorporation between spectators-agents and work of art give life to proposals of art like this, it forms here another voice with which Mouchette dialogues. Many of the items we use as material, tool and energy for this text could and deserve to be worked on in specific research. We envisage in this merit the opening for new tours. In the consequences of the assumption of a constitution that embraces the ideas of nature-culture, of cyborg as something beyond an “extended human being”, of “techno-imagination” as the main quality of the viewer-agent in the current state of communication, Possibilities of continuing the exploration of this nebula that we have here glimpsed. It is true that we do not yet have fully adequate methods to deal with a large part of the art-media that has emerged since the beginning of the popularisation of the internet. If we include in this account the consequences of the massive use and increased processing power of data-connected mobile devices, we can not only see ourselves without tools for analysis but also lucidly follow the narratives and fictions that have emerged in this scenario.